Hi, sometimes the PowerPoint preview is not visible anymore when something is changed in the script. The only option to make it visible is to re-add the PowerPoint to the script. Are you guys aware of this bug? I use PowerPoint 2016. Hi! Just to be sure, when you say script, you refer to the service manager, right? Yep, that's correct. But it can also be caused by a change in a lyric (in the script). Hi, yes we have the same problem, on two Windows 10 PCs. 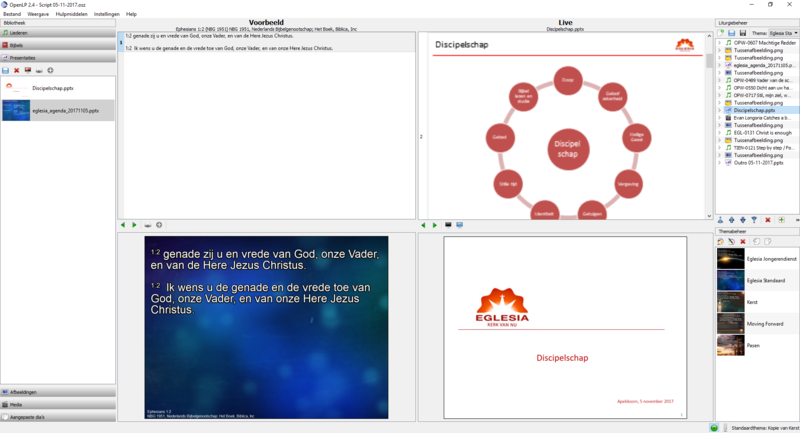 When you first import a PowerPoint it seems fine, and you can preview it and see the thumbnails of all the slides in the preview and/or live window. But when you save the service and reopen, the thumbnails are totally gone, in preview and in the live window. Instead you just get one blue screen as the first PPT slide, and then all the others are just blank white rectangles. If you click on a white rectangle though, it will display the appropriate PowerPoint slide to the projector. I've found a folder in the data where these images are created, and they're still there when the service is reopened, but no thumbnails. Very strange. In order to restore the thumbnails, you have to delete the PPT from the service and then re-insert it. Then it works again. I've been trying to sort it all afternoon and made no progress, and this is on 2 PCs running Windows 10. I was starting to think I'm going a bit crazy, so I'm glad to hear I'm not the only one! This PC has PowerPoint 2010 as the presentation software and we're running the lastest OpenLP. 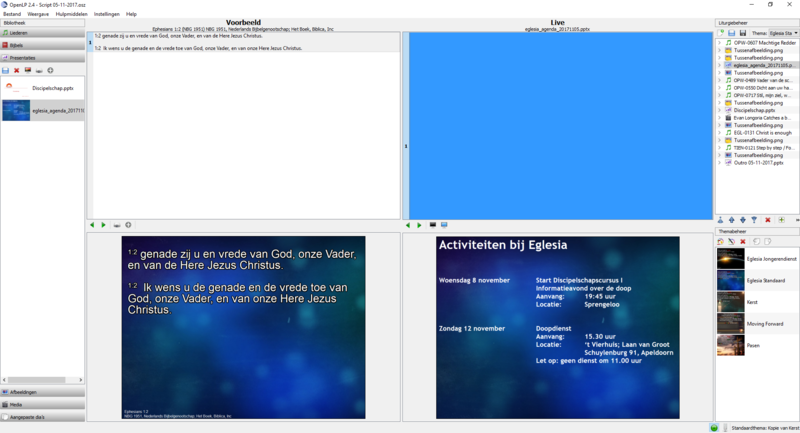 We used OpenLP in our previous church for years, and it was great. Now in the new church we have posh Easy Worship, but it keeps crashing mid-song, and so I thought we would go back to my favourite OpenLP, but no luck so far. Thank you to all of you for your hard work for the Kingdom. No problem, I will do that next Sunday. I just send the debug log. Thank you for looking into this. I've run in Debug mode but I can't find the debug file. Sorry. I am using a non-standard data location. Do you think that might be a problem? I am displaying hidden items as well. @sarahorme I don't use Windows, but I think the log file is in your data directory. That would be the first place I'd check. in my case the log file was located in the %APPDATA% folder of the user profile. I had to search for openlp.log to find it. Looks like this is solved in version 2.4.6. Thanks! This morning the issue popped up again. Maybe this was because the PowerPoint contained animations. I am running OpenLP 2.4.6 and still have the same issue. Windows 10, powerpoint 2016. Was there ever a resolution to this? My powerpoints are pretty basic, no animations or anything. @SidewinderAIM9M, tell us exactly what happened please. What steps led up to the problem? What *was* the problem? What have you tried? Etc. You can try re-saving the .pptx (I assume) as a .ppt (PowerPoint 97 or something similar) and see if it works. Please reply back either way - the more information we receive, the better we can investigate the issue. Thanks! If I add a powerpoint to the service and then send it to "live" I can see a thumbnail of all the slides in the "Live" window with a number next to them. After saving the service however, when I "Go Live" the "Live" window shows only the numbers and a blank white box where the thumbnail should be displaying. Everything else functions as it should (I only lose the thumbnails and have to use the green arrows to navigate powerpoint). I tried saving it down (to 97-2003) as you suggested and had the same issue. I also have this issue on two other computers with Windows 7. Typically for a service I open the file I saved the previous day then I remove the powerpoints and add them back in so that I can see the thumbnails. I don't know if you could PM me but I could take screenshots if that would help. Thanks! I appreciate your interest in the issue! This morning this issue has popped up again. So I made a screen shot. Hopefully you can solve this issue... Configuration: OpenLP 2.4.6, PowerPoint 2016, Windows 10 Fall Creators Update. It's strange that another pptx in the same script is displayed correctly. See attached screen shot. I'm having the same problem too: Win10 1709, PPoint 2016 updated and OpenLP2.4.6. Previews of ppt & pptx don't show although the live tile will. @witterholt can you send us your log file the next time this happens please? Thanks @Flangehed that's a very helpful log file. It looks like PowerPoint is complaining about something in what OpenLP is asking it to do. @Flangehed. Thank you for the log! It seems the presentation is missing some information that openlp expects. Would it be possible for you to share the presentation? After re-reading the log, the error seems to be that the thumbnail generation tries to create a file that already exists and is opened by someone else (most likely OpenLP). So we need some better error handling! Ah Ok. We use a shared drive for the presentations and source files so that services can be built at home and then loaded in the church building. The error happens with any powerpoint that we use, so it's not a particular file but the application would only be open on the pc presenting the service. So perhaps the shutdown process on the shared drive is the issue where the files aren't 'marked released' by the one pc before being opened on another machine?